Flipper Definition - Do Penguins Have Wings? 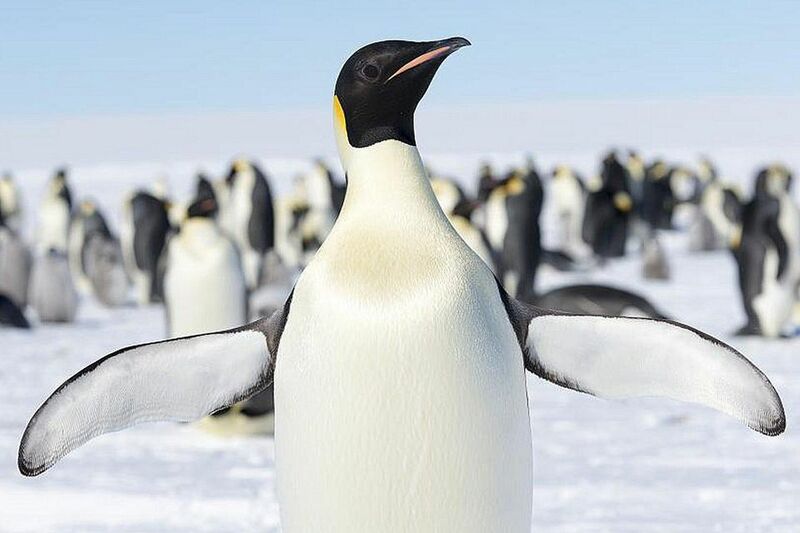 (noun) A flipper is the specialized wing of a penguin, with a unique shape, structure and characteristics adapted for underwater use rather than aerial flight. Very few birds have true flippers, but all penguin species do. Their wings are flat, thin and broad with a long, tapered shape and a blunt, rounded tip. Because of that severe, streamlined shape, penguins cannot fly, but they are powerful, agile swimmers and adept underwater hunters. Unlike other swimming birds such as ducks, swans and geese that use their feet and legs for primary underwater propulsion, penguins use their flippers for propulsion. A penguin's feet and legs are used principally for directional changes or braking underwater, and they are ungainly and clumsy on land. Unlike the wings of birds that fly, penguin flippers can only be moved from the shoulder. The elbow and wrist are almost completely fused, which gives the flipper more power and strength in the water but limits its flexibility. This allows faster swimming and movements such as porpoising, as well as helping the flipper to still function effectively despite high pressure from the water or ocean currents without risking injuries. The shoulder is also less flexible than the shoulder of most passerines or other flying birds. Penguins cannot lift their flippers straight up into the air or reach well above their heads or over their backs like flying birds can. These movements are essential for flight but would waste energy and create excessive drag underwater for swimming birds. Penguin flippers do have feathers, but instead of primary and secondary feathers that are critical for flight, the feathers on a flipper are smaller, shorter and more densely packed. This helps streamline the wing to minimize underwater drag and provides superior insulation to protect against cold water. Flippers also typically have countershading coloration that is light above and dark below to help camouflage the bird in the water so it can approach prey more easily. This coloration also helps the penguin avoid its own predators. In addition to being essential for swimming, flippers are also used for communication among penguins. These birds will pat or tap each other's flippers as part of their courtship behavior, and flipper slapping or waving can be used to show aggression, agitation, excitement or dominance. For locomotion on land, flippers can help penguins propel themselves when tobogganing on the ice. When running or hopping, flippers may be held out from the body for balance, or on cold nights, the flippers can be held tight to the body for better insulation and to conserve body heat. While penguins are the only birds that have true flippers, other pelagic birds that spend a good deal of time swimming also have some flipper-like characteristics to their wings. Puffins, murres and auks all have wings that more closely resemble flippers, but to a lesser degree than penguin wings. Because their wings are so similar to flippers, these birds - while they can fly - are generally ungainly in the air and may appear clumsy or awkward in flight. Their flipper-like wings help them be much smoother and more graceful in the water, and they are powerful swimmers and efficient underwater hunters. If they feel threatened by predators, these birds are more likely to dive into the water than to take flight to escape. Some other bird species are adept at using their wings underwater, but are also agile fliers. Dippers, anhingas and darters are all excellent swimmers that use their wings for underwater propulsion, but they are also good in the air. Their wings show fewer aquatic adaptations, and while they are useful underwater, these birds typically only swim for short distances or in more limited capacities. They may use their feet more prominently underwater than penguins will, and are able to easily switch between activities in the air as well as underwater. In general, the more pelagic a swimming bird species is, the more its wings resemble flippers. Freshwater aquatic birds generally have more adaptable wings with fewer flipper characteristics. What Birds Don't Fly? Get the Complete Flightless Bird List! How Do You Define Toboggan for a Penguin? What Makes a Hummingbird Unique?